Anemia is a medical term referring to a reduced number of circulating red blood cells (RBC's), hemoglobin (Hb), or both. It is not a specific disease but rather it is the result of some other disease process or condition. Hemoglobin delivers oxygen to the cells and tissues of the body, and an anemic patient will suffer from symptoms related to a lack of oxygen. 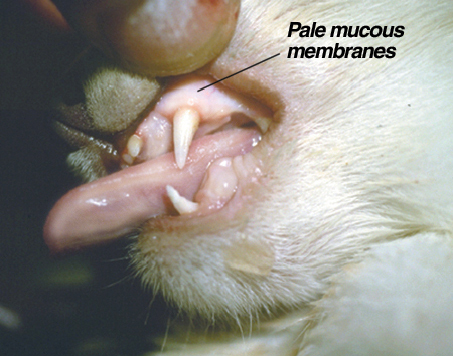 "Pale gums and lethargy indicate the need to perform blood tests." Several tests are performed on blood samples to diagnose anemia. These tests are often performed as part of a complete blood cell count (CBC). The most common test to diagnose anemia is thepacked cell volume (PCV), also called the hematocrit. To measure the PCV, a blood sample is processed in a centrifuge to spin down or separate the red blood cells from the plasma (the liquid part of the blood). Once separated, the sample is measured to determine what percentage of the sample is made up of red blood cells. Twenty-five to forty-five percent of the normal cat's blood will be red blood cells. If the PCV is below 25%, the cat is anemic. Others tests to determine anemia include the red blood cell count and the hemoglobin count. When there is evidence of a low red blood cell count, it is important to know if the bone marrow is producing an increased number of new red blood cells in response to the lost red blood cells. Some new red blood cells will be released prematurely, and these immature red blood cells, calledreticulocytes, can be stained for easier identification on the blood smear. The presence of increased numbers of reticulocytes indicates that the anemia is "responsive". Most automated blood analyzers will detect the presence of reticulocytes, helping your veterinarian quickly determine whether the cat has a responsive anemia. "These tests providing important information about the overall health of the cat." If your cat's anemia is so severe that it is life threatening, a blood transfusion will be needed. 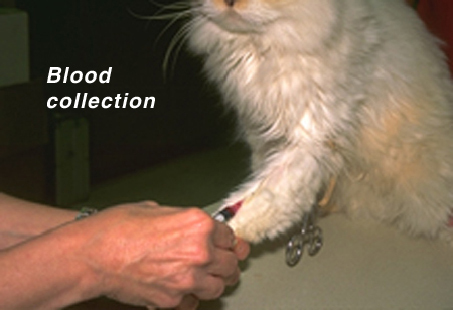 Before giving your cat a blood transfusion, blood samples will be taken for diagnostic testing. The main purpose of a blood transfusion is to stabilize your cat while the underlying cause of the anemia is determined and other treatments can begin to take effect. Further treatment will be determined once the underlying disease causing the anemia has been diagnosed. Treatments may include corticosteroids, anthelmintics (de-worming medications), other medications, or surgery. Your veterinarian will outline a treatment plan specific for your cat's needs based on diagnostic test results. "Most cats, if the anemia is diagnosed early and they are in relatively good health, have a good prognosis." The prognosis for cats with anemia is based on the specific diagnosis and the patient's condition prior to initiating treatment. Most cats, if the anemia is diagnosed early and they are in relatively good health, have a good prognosis. Cats that are anemic due to toxins, cancer or autoimmune diseases, or have suffered severe trauma have a less favorable prognosis.